Joseph Nolan brings his monumental Widow series to the gentlest of ends. After so fearlessly traversing the sublime peaks and troughs of Widor’s ten organ symphonies, it is fitting that Joseph Nolan should seek repose by following up such an arduous journey with a collection of some of the master’s smaller-scale organ works. 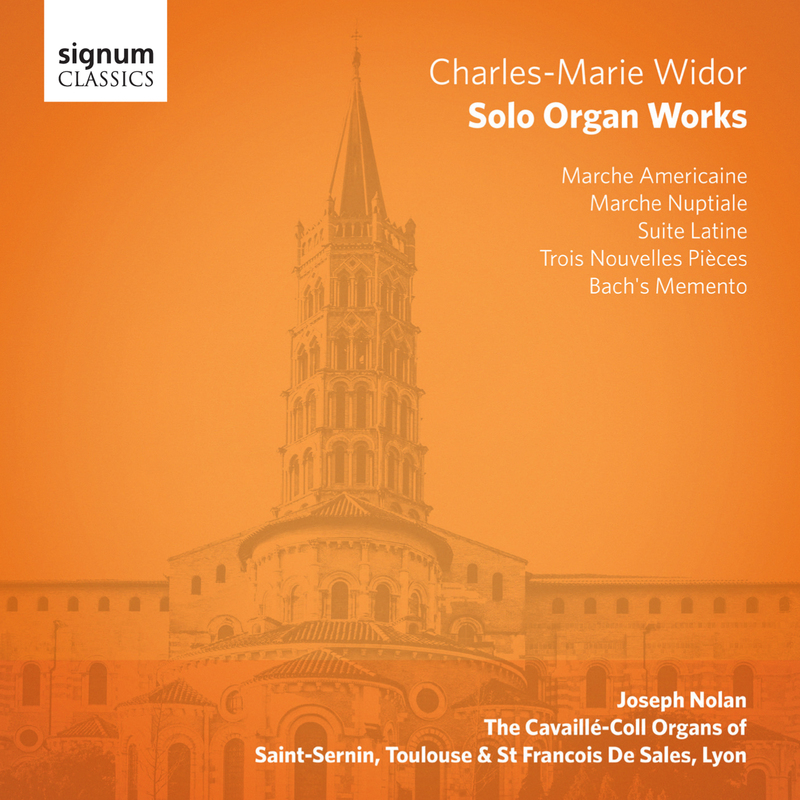 For this recording, Nolan performs on two fine Cavaillé-Coll instruments, the famous three-manual 1888 organ of St Sernin, Toulouse and the beautiful three-manual organ of St François De Sales in Widor’s birth-place, Lyon. It was on this latter instrument that Widor gave the premiere of the Fifth Symphony. The six movements of Widor’s Suite Latine, written in 1927, form a crescendo which begins with a dark, solemn Praeludium and ends in a magnificent Lauda Sion. The refulgent sweetness of the following Trois Nouvelles Pièces (1934) belie their composer’s age of 90 years. Bach’s Memento comprises six paraphrase/transcriptions of music by Widor’s beloved JS Bach, including two preludes from The Well-Tempered Clavier and the final chorus from the St Matthew Passion. Finally, two works in a lighter vein, the Marche Americaine and Widor’s organ arrangement of the Marche Nuptiale from the incidental music Widor wrote for an 1891 production of Auguste Dorchain’s play April Tale. A pupil of Marie-Claire Alain and Gillian Weir, Nolan has been Organist and Master of Music at St. George’s Cathedral, Perth since 2008. Last year he was made a Chevalier in the Ordre des Arts et des Lettres in recognition of his services to French Music. Here, for the most part, he swaps the blazing intensity that characterises much of his organ symphony recordings for a reflective introversion that reveals yet another dimension of this remarkable musician’s playing. This is nowhere more apparent than in the dappled light of the Praeludium and Beatus Vir from the Suite Latine and the glowing aquarelle sweetness of Classique d’hier and Mystique from the Trois Nouvelles Pièces. The Cathedral’s organist Olivier Latry has thanked everyone for their messages of support. A rare work of genius gets the performance it deserves. The British conductor talks to us about Mozart in London, Limelight's Recording of the Month in September. Wolfgang’s Boy’s own story: Maybe it’s because, for all of 15 months, Mozart was a Londoner. Joseph Nolan saw colleagues’ jaws drop when he decided to move from London to Perth in 2008, but thanks to some enlightened West Australians, his cathedral, choir and career haven’t looked back. The Perth-based organist's album Midnight at St Etienne du Mont is Limelight's Recording of the Month for March. Music of the night: Perth’s prestidigitator conjures up some musical wizardry after dark. The Queen of Sheba's long-awaited Perth arrival doesn't disappoint. Ahead of its WA premiere, the organist reckons Handel’s oratorio offers more than just The Queen of Sheba’s ubiquitous arrival. Perth Cathedral's Master of Music will finesse the Town Hall's mighty instrument for a whole week of French organ grandeur. Walton's The Twelve the highlight in the Consort's latest offering. Louis Moss has received a scholarship to play at Jesus College, becoming the youngest ever Oxford organist. Joseph Nolan pulls out all the stops and is 'knighted' for his pains. Joseph Nolan plans to welcome the Queen of Sheba amongst a programme ranging from Bach to Britten. What do you get when you place nuts and bolts on the keys of an organ (apart from a smack on the wrist from the organist)?